I hope everyone has survived New Year's, and made resolutions to meet a new member every week! So what's new there? Photo sharing is now embedded into the chat. When you are in a private chat, there's a photo icon near the top right of the page. 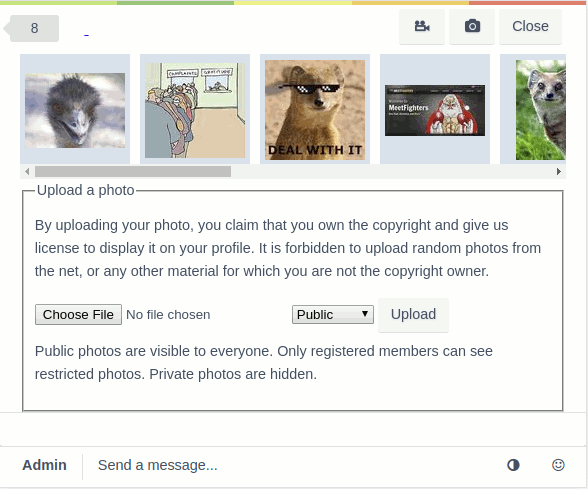 Clicking it will allow you to send one of your photos to the other person, or upload a new one to share with them. I think this is pretty cool and bound to make the chat experience more streamlined. I am also working on experimental support for webcams. Unfortunately support for this very new web technology is still spotty. I have added a "Webcam" button to profile pages that lets you test drive it, but don't expect it to work very spectacularly. Browsers like Internet Explorer and Safari do not support the necessary technology and there seems to be a bug affecting Firefox, so for now, Opera and Chrome are the only working alternatives. I'm working on improving that. I am also investigating the possibility of toggling a more compact view for the message list – some do not seem to like the pictures there. Maybe a darker theme too, as some mentioned that the white is too white. I am working on a improving the Browser Chat, based on the latest Kiwi IRC release. If you have some time, give it a try and give me feedback in a comment below. Click here to try the new browser chat. As mentioned in the previous news post, I've been working on the design update. I thank everyone who responded to that news post, the reaction has been overwhelmingly positive. I am proud to announce that the job is finished, and the new, fully mobile ready and responsive design is here. The structure imitates the look and feel of the previous iteration closely, but under the hood much is modernized. Look at the profile menu near the top right. Some menu items are on the left now, if you have a narrow screen, tablet or mobile phone, you need to click the burger icon near the top left to access them. The rest of the links are on the main page and in the footer at the bottom of the page. Please add your comments and questions regarding the changes below. In the likely case that I don't post anything else this year, I wish you all great and fighting-filled holidays and a Happy New Year! This blog post is to announce that MeetFighters has passed 15,000 active members! This is the "raw", uninflated number of members who have logged in at least once in the past month. We never inflated our numbers, not when we were the smallest, and not now that MeetFighters is the largest wrestling personals site. Let's celebrate, and what better way to do that than to show you the upcoming new site design for mobile devices. Please note that these designs are just "wireframes", which means that they represent structure and layout, but not style such as fonts, colors or sizes. I'm happy with the existing two color schemes of the site and not planning on changing them. The user menu, which has links to your profile, settings and related stuff is on the right. The burger button is now on the upper left. Tapping the burger button slides a sidebar in from the left, showing links to the most frequently used pages. Tapping the user button gives access to your profile and settings. For tablet users and small laptop screens, we also show the member ticker (horizontal scrollable list of random profiles), and a search field in the navigation bar. The "What's new?" page will be renamed to "Content" or something similar, and will directly link to the latest stuff such as photos, videos and blog posts. Continued work on improving layout for smaller screens. Don't forget to vote for member-submitted ideas! This is the plan so far! Feedback is, as always, appreciated. Thank you all for making this the most popular and fun site. Many categories have been clarified. Read the full list of rules here. It's a bit better organized now. The Members page now lists the members who are closest to your primary location. Avatar photos are now circles. There's a bit of AI driven logic that tries to guess where the face or similar focal point is in the photo when it is cropped. It's not working 100% of the times, though, so if you need to adjust your avatar photo, you can do so by clicking the "Edit" button next to your primary photo on the photo management page. Member lists now show the country as a flag icon and your distance to the user's primary location. If the member is your favorite or past opponent, there's color badges to indicate that. You are now notified when your favorites post something on their blogs. You can see a collection of a member's latest forum posts on their profile pages. Improved support for touch devices (tablets and smart phones).